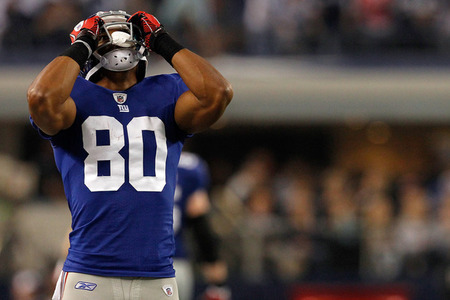 There’s a joke going around Twitterland that WR stud Victor Cruz saw the Giant’s team physician after the game on Wednesday night who told him he had a very high immune system and that if it didn’t change it would mean that he wouldn’t catch anything! I don’t have the statistics right in front of me but if I were to venture a guess, I would say that Cruz had three drops in all of last season; and I would be close. Did his three drops on opening night in E. Rutherford, N.J. cost the N.Y. Giants the game? No. They only lost by a touchdown. But they were costly nonetheless. What could have been more costly over the course of the game was rookie David Wilson’s 1st quarter fumble. Wilson, who electrified the crowds and Offensive Coordinator Kevin Gilbright in the pre-season, never lined up in the backfield again after his blunder causing the G-Men to go exclusively with Ahmad Bradshaw the rest of the game. He ended up fighting for every inch of the 76 yards he did manage to roll up. Even the Karma wasn’t very good. 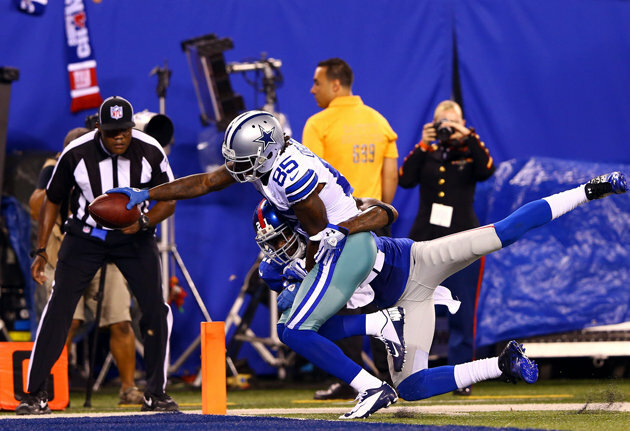 The Cowboys didn’t play a ‘great’ game ; the Giants played a worse one. Dallas was called for double-digit penalties (13), was devoid of a running game the entire the first half, and had a Romo pass intercepted by LB Michael Boley for a 52 yard return. Queens native WR Kevin Ogletree, perhaps the Victor Cruz of the 2012 season, caught 8 passes for 114 yards and two touchdowns. Not Austin Miles, not Dez Bryant, not Jason Witten; none of them. In his first three seasons, Ogletree had caught just 25 passes and had zero touchdowns…Can you spell K-A-R-M-A? If you can’t, I can tell you that the Cowboys had plenty of it on the field on Wednesday night vs the Giants- their first Wednesday night game since they defeated the Pittsburgh Steelers 14-12 on Oct. 3rd, 1934. And then there was the Giants depleted secondary; no Thomas, no Prince, and even replacement Michael Coe went down with a hamstring injury during the game. An ineffective 4th stringer forced the Giants staff to look through the stands for a healthy concessions staffer to help out, but the beer sales were too brisk for the guy to suit up! Cruz dropped two passes ? Don’t worry it could’ve been worse , rumor has it that Plaxico Burress wanted to invite him out to a gun range prior to the game . If interested let me know what you think of the following ? In order to view just click unto the link shown . MLB piece : does Clemens really want to return to MLB ? Or does he still remain a publicity seeking w##re ? cruz had seven drops last year, tied for 10th in the NFL. I hope you’re right. They should let all their frustrations from the loss to Dallas out on the Bucs this week. It could get ugly early.. Speaking as an individual who lives in Central Florida and where sports’ talk radio here is encapsulated around the Bucs , Lightning Rays and Magic . At this time of the season as the NFL starts its long schedule . It’ll be fun to hear what the Bucs’ fans have to say about the team especially the comments from the fans who actually care to turn up and see the Bucs play at Raymond James Stadium . The area here is known for its fair weather fans , Consider the fact that of the Bucs’ last seventeen regular season home games , fifteen have been “blacked out” because they cannot sell the allotted tickets required . In their season opener against the Panthers , the same thing happened again , and that was in light of the recent changes made by the NFL to assist the teams that face such a predicament . Go figure ! When the Bucs face the Giants in New Jersey I can see that Giants’ defense getting to Josh Freeman ! Likewise their offense will test that Bucs’ somewhat shaky offense and that’s in spite of the rejuvenated play of Ronde Barber some of his new teammates .